Videos are the heart of numerical simulations. Although graphs and statistics quantify the results of a simulation, animations and videos let us show results in a dramatic way that makes the results clear. To view the videos, click on the images. The movies are 5-50 MB and may take awhile to load and run. 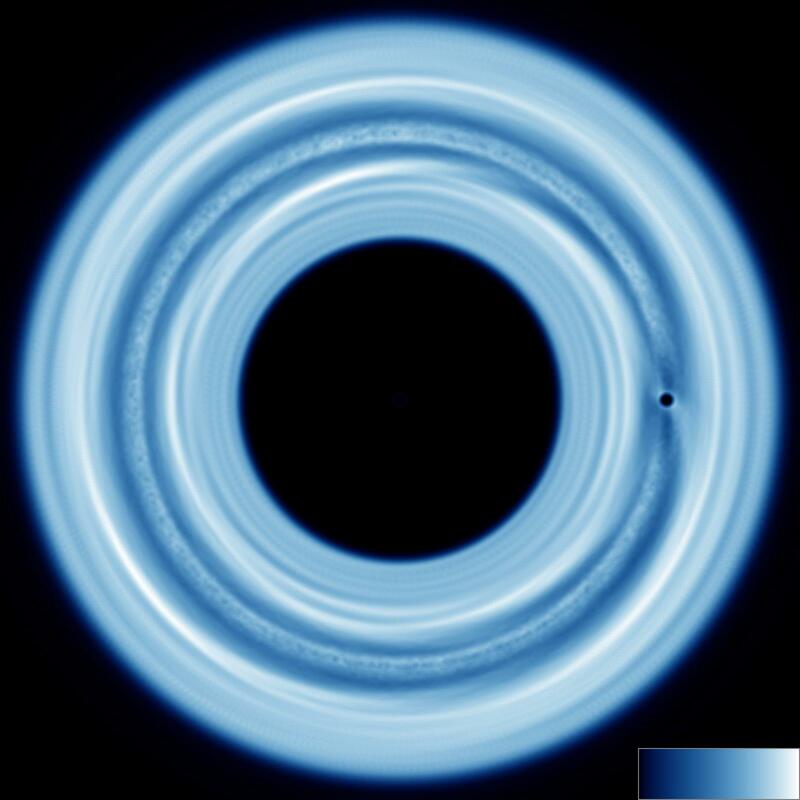 When a planet lies embedded within a circumstellar disk, it exchanges angular momentum with material in the disk. As a result of this exchange, disk particles inside the planet's orbit speed up. To conserve angular momentum, the planet slows down and moves radially outward. Outside the planet's orbit, disk material slows down, pushing the planet inward. 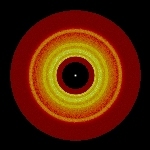 The combined impact of the entire disk results in inward or outward migration, which is a central issue in planet formation. The video shows a planet migrating inward through the disk. To learn more click here. Sedna is one of the most distant worlds known in the Solar System. Now almost 90 AU from the Sun, it has an orbital period of roughly 10,000 years! To try to understand the origin of its highly elliptical orbit, Ben Bromley & I simulated an encounter between two stars with nascent planetary systems. 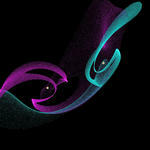 Aside from generating some artsy images, some encounters produce Sedna-like orbits. The simulations suggest Sedna might be the nearest exosolar planet! The video shows one of our simulations. To learn more, click here. 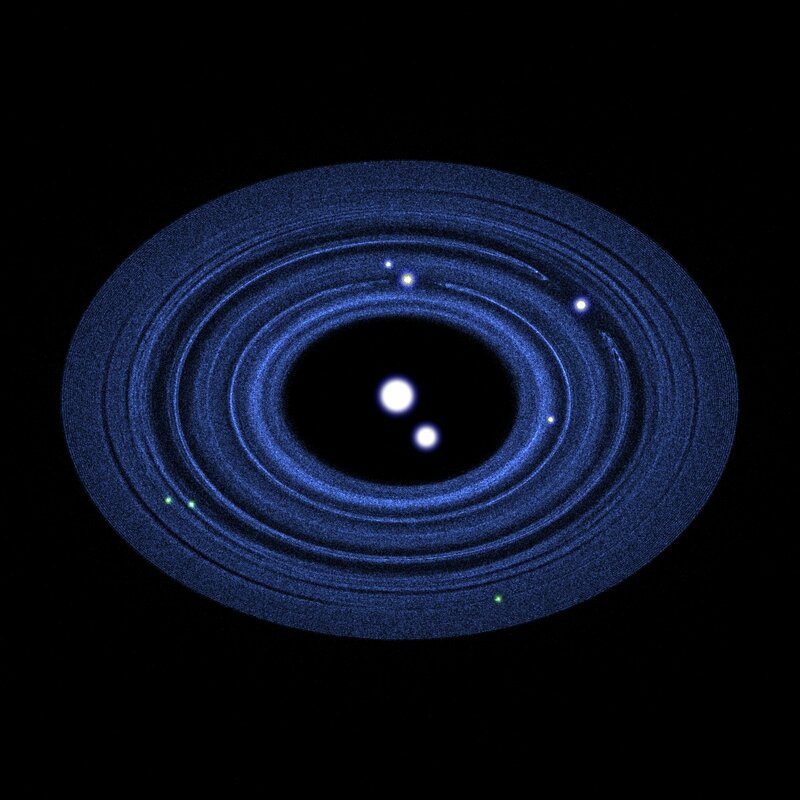 Every planetary system forms from a thin disk of gas and dust in orbit around a young star. Planets grow from collisions and mergers of smaller objects, known as planetesimals, embedded in the disk. Protoplanets with radii of 100 km or more stir up the remaining planetesimals along their orbits. A cascade of collisions among rapidly moving planetesimals produces a ring or a disk of dust grains, which slowly disappears as protoplanets sweep up the dust and grow into planets. Earthbound observers identify the dust as a debris disk, which serves as a signpost for newly-formed planets. In 2015, NASA's New Horizons mission visited the Pluto-Charon binary planet. Currently, four smaller satellites (Nix, Hydra, P4, and P5) orbit the binary. Our computer simulations demonstrate that the known moons can form in a disk of debris surrounding Pluto-Charon. These simulations predict an ensemble of smaller satellites beyond the orbit of Hydra. Depending on the source of this debris, the satellites might orbit within a disk of debris.